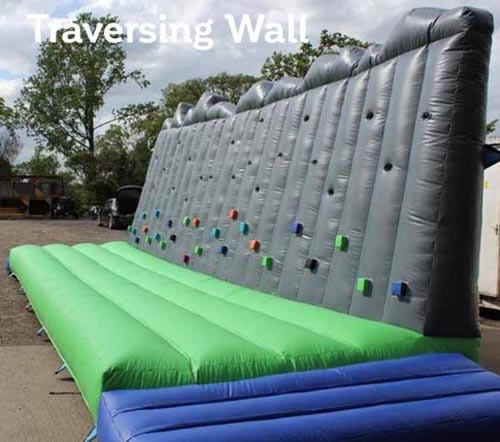 Our traversing type climbing wall is designed for children up to age 14 and does not require the use of harnesses. The aim of the game is for the users to traverse from one side of the inflatable wall to the other using the footholds and handgrips. Because there's no real height involved it's great for users who may suffer a fear of heights and if they fall off they simply land on the soft inflatable mattress. As the wall is inflatable it can be used indoors or outdoors and will fit through a regular width doorway. The climbing wall requires an overall operating space of 46x20ft with a height clearance of 12ft if the event is being held indoors. The climbing wall is supplied with one of our friendly staff members who will run the activity for you and ensure its safe use.